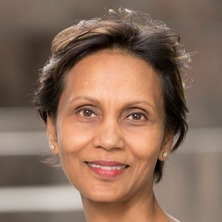 Professor Gita Mishra’s main research area is on life course epidemiology and women’s health. Professor Mishra is Head of the Epidemiology and Biostatistics Division and Professor of Life Course Epidemiology at the School of Public Health, University of Queensland (UQ). She is also Director of the Australian Longitudinal Study of Women’s Health (ALSWH). Prior to this, she was a Programme Leader at the MRC unit for Lifelong Health and Ageing, University College London, UK. Professor Mishra is currently an NHMRC Principal Research Fellow (2018-2022) and previously held a prestigous ARC Future Fellowship (2013-2017). She is internationally recognized for her expertise in women’s health and life course epidemiology, especially the links between reporductive characteriestics and non-commuunicable diseases (NCDs) in later life, such as diabetes and cardiovascular disease. Professor Mishra has more than 300 peer-reviewed scientific papers and book chapters, including as co-editor of a key academic textbook on Family Based Studies. She is an accredited Chartered Scientist (Science Council) and Chartered Statistician (UK, Royal Statistical Society). In 2017, she was elected as a Fellow of the Australian Academy of Health and Medical Sciences (FAHMS); awarded honorary membership of Sigma International, a global nursing organisation, for her contribution to women’s health; and was elected as an board member for the European Menopause and Andropause Society (EMAS). Does psychosocial stress explain socioeconomic inequities in 9-year weight gain among young women? How do health behaviours relate to dietary practice patterns among Japanese adults? What can the life course approach contribute to an understanding of longevity risk? Do factors that predict attrition change across waves in a longitudinal study of older women? Association of diet and lifestyle with glycated haemoglobin in type 1 diabetes participants in the EURODIAB prospective complications study. How do women’s diets compare with the new Australian dietary guidelines? Is adult education associated with reduced coronary heart disease risk? Do childhood cognitive ability or smoking behaviour explain the influence of lifetime socio-economic conditions on premature adult mortality in a British post war birth cohort? What evidence is there that adjustment for adult height influences the relationship between birth weight and blood pressure? Which Food-Related Behaviours are Associated with Healthier Intakes of Fruits and Vegetables Among Women? Whose socioeconomic status influences a woman's obesity risk: Her mother's, her father's, or her own? How well do Australian women comply with dietary guidelines? Which aspects of socio-economic status are related to health in mid-aged and older women? Which aspects of socioeconomic status are related to obesity among men and women? What is a healthy weight for middle aged women? Is there a role for physical activity in preventing cognitive decline?